As most of you know, I have coffee with my mother almost every morning. This morning, I got there a little late, and she had already finished breakfast. 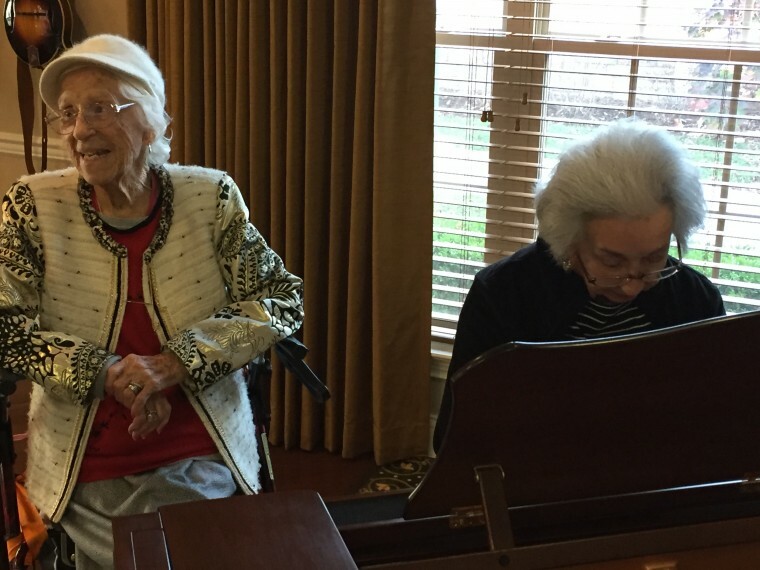 When she finished breakfast, she moved into the activity room and started playing the piano. When I walked in, I heard the piano. Immediately, I knew it was her playing. As I made my way back toward where she was, I noticed a small crowd gathered around the piano listening to Mom play. Some would clap their hands, others would tap time with their feet, and a few were even singing along. Mom played her favorite hymns, one after the other. Without ever looking at a piece of music, she played and played. Listening to her play has been the soundtrack of my life. Illness has taken a lot from my mother. A lot of the things she used to do, she can’t do any more. There are a lot of things she can’t remember any more. But she remembers the hymns. She can still play the hymns. And she does. In a place where she doesn’t want to be, she still plays the hymns. It’s the way she prays. It’s her testimony—her protest against life that has taken so much from her, metered out in 3/4 time. And along the way, she helps her friends through the bad days. Funny, isn’t it? After all of these years, I’m still taking lessons from Mom. I love the stories about your mom. The things she says to you over coffee and the stories you tell about how you were raised by such a strong women. It’s heartbreaking to see the toll her illness is taking on her. This story reminded me of a time in choir when Cliff Duran told a story about going into a nursing home where there were a group of people suffering from Alzheimer’s. They couldn’t remember who you were or what you were doing there. But as soon as he sat down at the piano and started to play the piano it was as if God allowed them to keep the only memories that really mattered. They would sing the lines of every hymn. Just as the “not so old” song says…. I am Barbara’s sister , Karleen ,a year younger than Barbara. She has been like a mother to me an my younger sisters since our mother died in 1950. She shouldered far more than a person her age (12) should have. She was my rock and I love her dearly.. Mike has looked after Barbara since John died and I thank him and Jeannie from the bottom of my heart. Barbara often gets lost these days (in her thoughts) , but I know she loves Us. I thank God for a son who loves his Mother for who she was and even after what the insidious disease alzheimers has done to her. This disease has robbed our family of Barbara . I love following you and your “Coffee with Mom”. I know how much some of her word must hurt you, yet your love and care remains steadfast. Your posts give me company on my journey with my dad. My dad is pleasant and not outwardly demanding yet he expects so much. I am faced with so many emotions, but my hardest delema is balance. How do I balance my dad’s needs with my needs. How do I postpone our (my husband and I) plans with the needs of my dad? What are God’s expectations of me? It’s a challenging time and I pray for answers and wisdom.